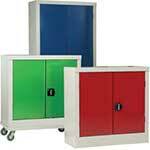 Construction as ESD protected workbench TP - 300kg capacity. 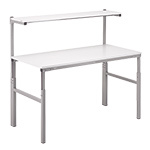 Workbench with upright profiles and a clean laminate shelf - maximum load capacity of 50kg. Main bench supplied complete with an earth lead set. 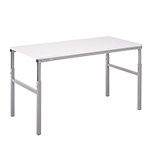 Height adjustable with Allen key, from 650mm to 900mm. The ESD Protected Workbench TPH also features a top-tier shelf for storage of equipment or an additional work surface, depending on the job. Any working environment in need of a technical workbench with a built-in storage solution needs the ESD Protected Workbench TPH. 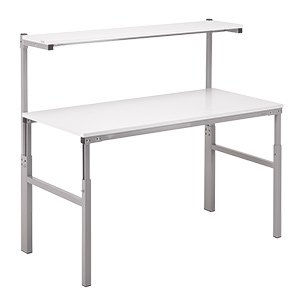 Perfect for a wide range of working environments including industrial, government, electronic, military, commercial, and manufacturing, this workbench is an affordable and durable choice. Designed specifically with ergonomics in mind and produced to meet exacting quality standards, the ESD Protected Workbench ties together all the elements needed for a professional, modern, safe, and productive working environment. An ESD protected workbench actually prevents the build-up of electrostatic on workers and sensitive electronics, thus hindering the chance of damage or injury during the work process. Electrostatic protective areas can be achieved by incorporating a number of implements into the area including conducting wrist straps, anti-static floor mats, and ESD protected work surfaces like this bench. The clean grey design fits easily into any workspace, especially since the height is adjustable. Both light duty and heavy duty cabinets are available for use with this workbench, as well as a wide selection of accessories. Q. How deep is the top shelf of the workbench?